A Subscription type where customers pay per license that is provisioned. Work 365 is integrated with the Product Catalog in Dynamics 365. This means that anytime a new subscription is created, looking up the product in the product field will then automatically populate the product details on the subscription. Setting up the product catalog provides Integration and automation capabilities that can save time during provisioning and billing. Note: The system uses the Provider Part Number and Provider to automatically provision the subscription and update the quantities. If you are using multiple Providers for the same product e.g. you have multiple Partner Centers setup it is important to have individual Products for each Partner Center or to leave the Provider field blank in the Product catalog to avoid automatic provisioning with the incorrect Provider. 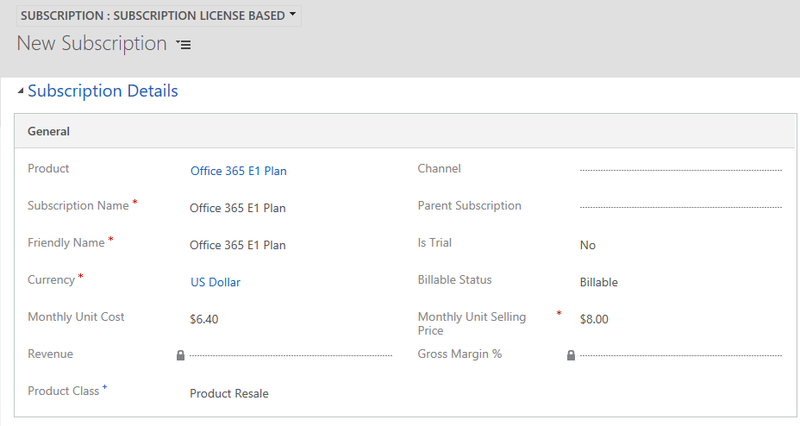 After the subscription is created in Work 365, the provisioning will either be provisioned automatically (if the provider is Automatic Provider like the Microsoft Partner Center). If the subscription selected is a Bundle all the child subscriptions will also be setup and Provisioned using the structure defined int the Product Catalog. The subscription will be eligible for Billing if the Billable Status is set correctly and it is not a Trial. If the Monthly unit selling price is blank the invoicing engine will enter a default value of -999 as the unit rate. Every change in the license quantity will result in a License Change Log item that is created.